Microsoft has released another SharePoint 2013 Cumulative Update in February 2015. 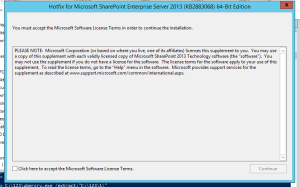 Let me help you know how we can install February 2015 on SharePoint 2013 server. Its per-requisites is either SharePoint 2013 SP1 or SharePoint 2013 March PU. Now the most important part is how to install SharePoint server February 2014 Cumulative Update. Office Web App server 2013 has only 1 setup filewacserver2013-kb2956101-fullfile-x64-glb.exe. Now when you run the main setup file exe file, you will be able to extract and install the update.Do not try to extract cab file it will be extracted by exe. Now system needs to be restarted. Follow the same steps on all SharePoint servers in farm. SharePoint PSconfig wizard on all servers. Note : SharePoint Server 2013 update contains the SharePoint Foundation update.Where as SharePoint Server 2013 with Project Server update contains Project Server update, SharePoint Server update and SharePoint Foundation update. Microsoft has released another SharePoint 2013 Cumulative Update in December 2014. Let me help you know how we can install December 2014 on SharePoint 2013 server. Now the most important part is how to install SharePoint server December 2014 Cumulative Update. Now when you run the main setup file ubersrv.exe file, you will be able to extract and install the update. Microsoft has released another SharePoint 2013 Cumulative Update in November 2014. Let me help you know how we can install November 2014 on SharePoint 2013 server. Now the most important part is how to install SharePoint server November 2014 Cumulative Update. [Update 2014-11-12] When trying to download the fix for KB 2889944 (SharePoint Server 2013 November 2014 CU) you will notice that there are 4 files listed rather than the usual 3 files. One of the files is corrupt and does not belong to the CU. You can ignore it. When receiving the mail with the download links just skip the file with name 479985_intl_x64_zip.exe. [Update 2014-11-12] When trying to download the fix for KB 2889949 (SharePoint Server 2013 with Project Server November 2014 CU) you will notice that there are 4 files listed rather than the usual 3 files. One of the files is corrupt and does not belong to the CU. You can ignore it. When receiving the mail with the download links just skip the file with name 479984_intl_x64_zip.exe. Microsoft has released SharePoint 2010 Cumulative Update in October 2014. Its per-requisites is Sharepoint 2010 SP2. Rather I would recommend you to install September 2014 CU before installing October 2014 CU. Note: This CU does NOT(!) include all SharePoint 2010 fixes previously released! It is recommended to install September 2014 CU before installing this CU. Be aware that for SharePoint Server you have to install the SharePoint Foundation fixes as well! Same for Project Server where you have to install the SharePoint Foundation and the SharePoint Server fixes. Microsoft has released SharePoint 2013 Cumulative Update in October 2014. Its per-requisites is Sharepoint 2013 SP1. It is said that it can work on Sharepoint 2013 March PU as well, but we found couple of issue with just March PU so I would recommend install October update after SP1. Rather I would recommend you to install September 2014 CU before installing October 2014 CU. Note: This CU does NOT(!) include all SharePoint 2013 fixes previously released! It is recommended to install September 2014 CU before installing this CU. Be aware that for SharePoint Server you have to install the SharePoint Foundation fixes as well! Same for Project Server where you have to install the SharePoint Foundation and the SharePoint Server fixes. Microsoft has released SharePoint 2013 Cumulative Update in August 2014. Its per-requisites is either Sharepoint 2013 SP1. It is said that it can work on Sharepoint 2013 March PU as well, but we face lot of issue with just March PU so I would recommend install August update after SP1. Microsoft has released another SharePoint 2013 Cumulative Update in September 2014. Let me help you know how we can install September 2014 on Sharepoint 2013 server. Now the most important part is how to install SharePoint server September 2014 Cumulative Update.